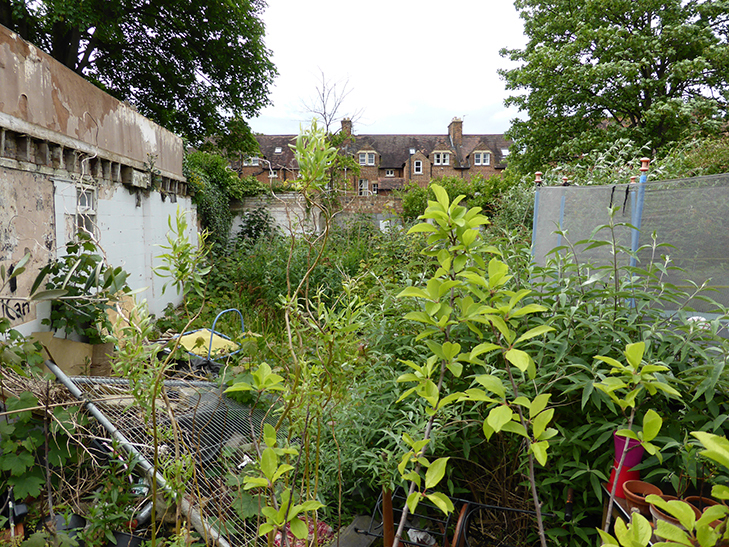 A derelict city garden, covered by concrete sheds and brambles needed to be completely cleared leaving the blankest of slates. Another of Dale & Heybrook Garden Designers ongoing projects. West facing, it was due to become a treasured family outdoor room providing year-round drama and interest. After 10 lorry loads of rubble out and 4 lorry loads of fresh topsoil in, the garden began to emerge. The oppressively high garden walls were reduced and tiles were chipped off to reveal the old brick. The breeze block concrete wall on one side was replaced with a handmade green oak fence. Soil compaction was addressed with boreholes. Ancient weathered Cotswold slabs with low-growing plants growing between were laid to form an informal terrace where flowers can self seed. Beyond the terrace, a lawn was eschewed. Instead, gravel paths lead out and wind through pockets of planting to intimate areas and a greenhouse at the far end. Topiary, semi-mature native evergreens and fruit trees blur the boundaries of this city plot and give privacy. The children can enjoy games of hide and seek and find secluded places to play and explore.